There are so many things I could and should be doing! Where do I even begin? Being in business is kinda lonely. You are not alone! Being in business or pursuing your goals isn't easy! But it doesn't have to be so hard. And it can be fun. Join Quincy Collective co-owner and Life Transformation Coach Katie Bagby for a monthly gathering to inspire your creativity, meet some supportive fellow travelers, and get clear on what you need to focus on this month, this week, today. Katie will guide you through a really helpful reflection and planning tool she's been using in her own business this past year (I learned it from Christine Kane). You'll come away with it feeling good about what you're up to, and clear on what to do next. Plus, you'll meet supportive friends and drink coffee. Investment: $5 drop in (cash, check, or credit). FREE for current Quincy Collective members. Come for all of it or part of it. Want to skip the meditation? 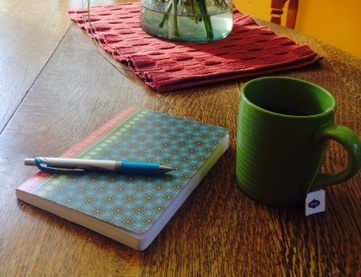 Join us at 8:50 and grab a cuppa and join us for the journaling. (Note, if you're not joining us for the meditation, please don't arrive prior to 8:50). On a roll and want to stay? You're welcome to stay and work on your goals for the rest of the morning. Seize the moment! Questions? Contact Katie at (530) 927-8599 or by email.